We have a limited number of Van Nicolas and Airborne bicycles: Valkyrie, Zeppelin and Manhattan titanium road bike (frame sizes: 50, 54, 58, 61cm with Shimano 105 groupset and carbon forks), Vitus road bikes (triple Campagnolo chainsets with carbon forks), and ALP bikes for hire. Road bike rentals are always in great demand therefore priority is given to cyclists enrolled in a bespoke or fully supported tour. Please contact us early if you want to hire one of our road bikes during peak season. We have chosen the proven FSR full suspension system for our mountain bike hire. The four bar linkage is widely acknowedged to be the benchmark for the design of rear suspension systems and the bikes are ideally suited climbing the rocky tracks in the pyrenees. If you leave your own bike at home and come looking for mountain bike rental instead, then these are the types of bikes you'll ride on a mountain biking holiday with VeloLoco. Be warned... you may return home with the desire to replace your current bike for the latest Specialized mountain bike model! 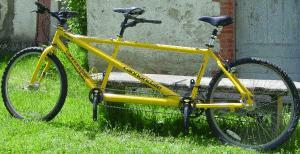 The ideal solution for couples of mixed cycling ability. A strong rider no longer needs to wait for a slower partner to catch up! They are always right behind you. Consequently, daily distances are much easier to attain, and communication becomes much less fraught. This alls adds up to a far better cycling holiday experience. Our tandems are from the best makers in the world - Santana and Cannondale. The Santana tandem is a stunning machine that can be hired for touring holidays of at least 4 days duration. The large deposit required to rent these tandems reflects their value. We expect that great care is taken of our all our rental bikes so that the pleasure you will get from your holiday may be experienced by our subsequent customers. The Cannondales can be hired for ventures off-road near Aulus-les-Bains, or for periods shorter than 4 days if touring by tandem. As well as gear range, our bikes are fitted with a strong rack, a barbag system that won't rotate on the handlebars and a cyclo-computer to keep track of progress. Water bottle mount points (three on our Specialized Sirrus Comps) enable greater distances to be covered between watering holes. The wheels obviously need to be strong (we use 36 spoke Mavic A719s on XT hubs), and tyres selected for puncture and low rolling resistance (we use Velox cloth rim tape, and Armadillo tyres). We start with a Specialized Sirrus, and with judicious changes of standard equipment, we create a fantastic tourer - on a hire bike like this, you can be assured of a great holiday! In 2004, Veloloco took the decision to offer Thorn Raven adventure touring bikes for all our cycling holidays after riding a test bike. We were so impressed by the Rohloff Speedhub's superb gear range on steep ascents and descents in the Pyrenees and the attention to detail paid to Raven frame that we believe these bikes are by far the best option for peace of mind touring whatever the terrain. We can equip either the Thorn Raven or Sirrus with cyclo-computer, barbag rack and panniers as required for your tour. The Thorn Ravens also have three water bottle mount points (as on our Specialized Sirrus Comps) to help avoid risks associated with dehydration. The wheels are built on 26 inch Sunn Rhyno rims and are fitted with Panaracer tour guard tyres (for improved resistance to punctures). The Raven is a fantastic tourer - on a hire bike like this, you can be assured of a great holiday! The rowbike is the latest invention from Scott Olson (inventor of rollerblades) and is the ultimate machine in sports fitness and it can be hired by the hour. It works much like a gymnasium rowing machine, as you push with your legs you roll back along a beam in the seat and pull the power arm. With each stroke, chain is pulled around the cassette which in turn propels you forwards. Rowbiking is tough work in the Ariege - even though the rowbike has seven speeds, it is hard work uphill until you found the correct rowing technique! The Burley child trailer has a rigid aluminum roll cage and weight centred over the axel. When pedalling with a child trailer attached to your bike, you hardly notice it's there at all! Cheaper designs place too much weight on the towing arm, giving the sensation of being braked by the trailer. The Burley trailer is incredibly stable at speed and around bends. We have not been able to cause one to tip up under normal road riding conditions. They have insect screens and very good ventilation. Importantly, there is no access to moving parts (such as wheels) from within the trailer. Little fingers are safe! The Bob Yak single wheeled luggage trailer is ideally suited to offroad tours. The slim design minimises the inconvenience of a trailer getting trapped in narrow routes. The single rear wheel that trails in the same line as the towing bike in front reduces the chances of getting a puncture. ie. if you steer to avoid sharp objects, the trailer will follow the same line.